The material is copyrighted © 1997 by Jeffrey Stanton. Workers at Dreamland on Friday May 26, 1911 were applying the finishing touches to get the amusement park ready for its opening the following day, Memorial Day weekend. If the pleasant weather held, it promised to be Coney Island's best summer season ever. That was an optimistic prediction because for the first time in a quarter of a century, Coney's amusement attractions would have to draw crowds without the powerful assistance of its three racing tracks. Reformers in Albany had passed strict laws against gambling at racetracks, and after a two year struggle, the tracks had closed the previous season. Coney's amusement attractions had always taken for granted the influx of free spending visitors in the evenings after the horse races had been run. Dreamland's owners had poured in another $60,000 to remodel and redecorate their park in hopes of recharging its sagging attendance. Samuel W. Gumpertz, was promoted from manager of the Lilliputian Village to Dreamland's top executive post. The park had been newly repainted cream and fire-house red, a little more exciting than its previous all white decor. By dusk everything seemed ready except one attraction. William Ellis's Hellgate, a boat ride through dimly lit caverns that progressed through rapids and into a giant whirlpool before depositing its passengers safely at the exit. It had sprung a leak three days earlier during a trial run. Ellis contracted Samuel Englestein, a tinsmith, to make the necessary repairs. He and his workers were caulking the leak with tubs of hot tar. 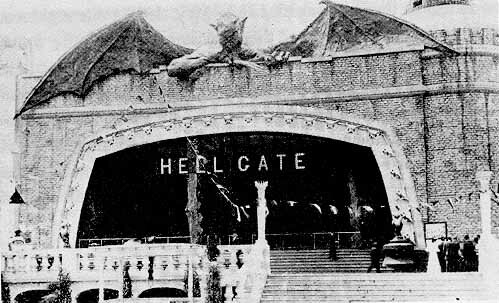 Hellgate, a boat ride through the caverns of hell, was the start of the Dreamland fire. At 1:30 A.M. inside Hellgate, overhead light bulbs began popping. The bulbs either began to explode from the heat of the tar, or from a short circuit. All at once the lights flickered and the men were plunged into darkness. One of the workers accidentally kicked over a bucket of bubbling tar and a moment later Hellgate was in flames. At first there was panic. Two or three workers rushed up the steps towards an exit and safety, while the others shouted and scrambled about in confusion. Epstein remembered there were some hand extinguishers and a reel of hose nearby. He and his workers wasted valuable minutes scrambling up the spillway in search of them. By the time they returned with them, they were confronted by a fire that was already licking at the rafters. With their efforts doomed, they ran for their lives. James Lillis, the night watchman, heard the running men and noticed the orange glow at Hellgate. He rushed into Dreamland's administration building and yelled, "Fire!" It was 1:58 A.M. when he yanked hard on the fire alarm switch. The alarm bells rang in the nearby fire house, the nearest which was on West Eighth Street, only 100 yards from Dreamland. Within moments, the horse drawn steamers, engines and hook-and-ladder trucks were racing through the streets. The alarm bells also rang at the high-pressure pumping plant and engineers there increased the pressure to 160 pounds. The station at Twelfth Street and Neptune Avenue was recently constructed to help fight Coney Island's periodic fires. It boasted five pumps that could deliver 4500 gallons per minute, enough to operate twelve lines of hose with a pressure of 125 pounds. It had been tested only the month before in a full scale dress rehearsal. When fire Battalion Chief William Rogers arrived, he took one look at the burning Hellgate building and ordered a second alarm sent. He then ordered three lines stretched from the high pressure Corey hydrants into Hellgate. When the nozzles were first opened, the firemen played their streams of water into the flames, but soon the streams of water fell short, then even shorter. Something had gone terribly wrong. Meanwhile the breeze was carrying the flames to either side of Hellgate, and Chief Rogers called in a third alarm at 2:06 A.M. The flames, fanned by the breeze, were getting higher and great flaring sparks lofted by the updraft headed for the Baby Incubator building, the Dreamland power plant and the soaring tower. Rogers was desperate and ordered streamers hooked up to the low-pressure mains. He then ordered a signal sent again to the main pumping plant for more pressure. But his frustrated men began to fall back from the heat of the blaze. Dr. Fischel arrived promptly at his Baby Incubator Building that was now threatened by fire. Smoke billowed through the doorway as he and the several nurses wrapped the six premature babies in blankets and carried them from the building into the safety of the night. Firemen from all over Brooklyn raced towards the Dreamland fire. Four engines and a truck at the first alarm; four more engines and two more trucks at the second alarm; three more engines and another truck at the third alarm. Other horse drawn fire equipment were in motion as they were temporarily assigned to fire houses that would have been stripped of equipment. Night watchmen and policeman hurried through Dreamland and the adjacent streets. They pounded on doors and shouted to upstairs tenants to evacuate to safety. The park reverberated with the sounds of exploding shells in the burning shooting galleries and the heat induced popping of several hundred thousand light bulbs. The animal arena was on the eastern side of Dreamland, a couple of hundred yards from Hellgate. By the time the night watchman aroused Ferrari and Bonavita (owner and trainer), and eight keepers out of bed, the wary animals were wide awake and restlessly pacing back and forth in their cages. Ferrari was confident that the fire could be halted on the other side of the lagoon, but in order not to panic the 80 odd wild animals, his plan was to let them out of their cages and into the main arena. With a steady crack of their whips, They kept the lions, pumas, bears, wolves, leopards, hyena and antelopes on a steady parade around the oval. Things were going as planned until the overhead lights flickered and went out. The terrified animals, lit by the red flickering glare of the 275 foot tall tower now aflame, panicked the wild animals. None-the-less Ferrari and Bonavita, with only the light from eight lanterns, managed to get five leopards and four lions, one of them the pregnant Victoria, into movable cages and dispatch them to a nearby livery stable. Six Shetland ponies were blindfolded and led along as well. However, Little Hip, the beloved elephant, refused to budge from the concrete block where he was chained. He would only obey Captain Andre, his bull man, who unfortunately hadn't returned from a farewell party in Manhattan. Capt. 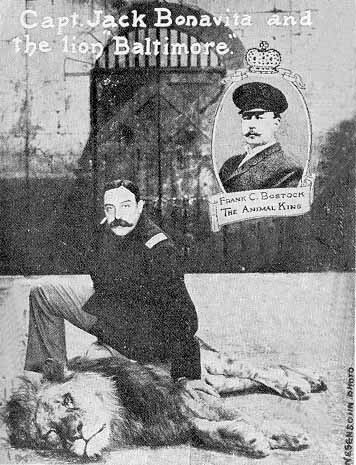 Jack Bonavita, Dreamland's lion tamer, with one of his lions. The fire was raging unchecked and the frustrated firemen sent to the pumping plant to find out what was wrong with the high pressure fire fighting system were dismayed when the engineers pointed to the pumps hard at work. The paper drum recorder showed that the line pressure had dropped from a high of 160 pounds to only 20 pounds. That meant that there were too many hoses connected to the system and they weren't just the fire fighter's hoses. It became obvious that in the first panicky moments after the fire had started, merchants all over the area had tapped into the system to hose down their flimsy wooden buildings to prevent flying sparks from setting them afire. The fire fighters had no choice but to send in the department's three fire fighting boats and battle the fire from the sea. Since the firemen became concerned that the sea breeze might cause the fire to leap across Surf Avenue, they used what little water they had to wet down the building facades on the north side of the street. Luna Park employees too, were busy wetting down the park's paper-mache palaces from what they claimed was a separate water system feed from the sea. The fire chief, Kenlon called in a double-nine alarm which meant that every fire company in Brooklyn that would normally answer a third alarm was to rush to Coney Island. Thirty-three fire companies had responded to the alarm, some from as far as eight miles away. The journey was so far for many, that teams of fire-horses pulling the equipment, had to be slowed down to a walk several times during their long journey to the sea. Huge Crowds drawn by the eerie red glow and by the tall finger of flame engulfing Dreamland's tower began to gather from all over Brooklyn and Manhattan. They were stopped by police lines at the edge of the fire zone, a mile from Dreamland. They had little to do but cheer the arriving horse drawn fire trucks. It was 3:10 A.M. when the Dreamland Tower, which had been burning for thirty minutes like a candle above a fiery hell, came down in a spectacular fiery crash. Luckily the cables for the high-wire bicycle show on the seaward side stopped the tower from falling onto the nearby animal arena. However, the frightened animals there began to fight savagely as the arena itself began to burn. The keepers began to flee while Ferrari, in vain, ordered them back to shoot as many animals as possible to save them from a burning death. He too had to flee from the flames after firing just a few shots. As he came out of the blazing entrance of the ring on to Surf Avenue, he encountered Captain Andre, the elephant's bull man who had just returned from Manhattan. He could hear the poor elephant's trumpeting last cries as the heat encircled it, but it was too late. A lucky bear cub managed to escape and ran out into Surf Avenue. A young man, who had an auto standing near the Luna Park gate, grabbed it, pushed it into his car, then quickly drove off. Meanwhile inside the park, the Midget City Fire Department sprang into action. After responding to hundreds of false alarms over the years, they finally faced the real thing. They bravely fought the fire with their miniature steam engines to save Old Nuremberg, but to no avail. Luckily the wind had shifted and began blowing offshore. The firemen rallied as they attempted to control the fire rather than extinguish it. A police launch, docked along the Dreamland Pier on the ocean side, was engaged in rescuing those who had been trapped by the flames. It too had to retreat as did the nearby fire fighting boats, when the fire's intense heat made it unbearable. The dense crowds watching the blaze from across Surf Avenue were suddenly startled when a creature ringed with flame burst through Dreamland's Creation entrance. The thing screamed in anguish before it moved into the street toward the crowd which scattered in panic. A three-year old black-manned Nubian lion called Black Prince emerged with its mane on fire, its eyes bloodshot and its flanks scorched and bleeding. The police with guns drawn approached it warily as nearby onlookers shinned up poles. They fired and Black Prince, roaring once more in anguish, sprang across the street into the entrance to Rocky Road to Dublin, an indoor scenic railroad. The lion climbed up the incline of the railroad as two trainers followed the cat's bloody footprints in near darkness. They were followed by Ferrari, Bonavita and two armed policemen. They could hear the great cat's roars ahead, and they the trainers kept firing their blanks to keep the cat on the move. When they finally reached the top and the open air, Black Prince was standing, outlined against the sky. He made a splendid target and Ferrari gave the cops the orders to fire. They emptied their guns into them as thousands watched from below. He fell and still twitched. Someone threw up an axe and policeman Coots split open his skull. They found 24 bullets in the lion's head alone. The crowd below roared and Black Prince's body was dragged down the incline and into the street for display at 3:25 A.M.
By this time the buildings on either side of Dreamland began to burn. It was hard to prevent the loss with so little water pressure. Within thirty minutes they lost Pike's Peak Railroad, L.A. Thompson's Oriental Scenic Railroad, Johnson's Carousel, the Whirlwind Ride, Taunton's Bathing Pavilion, Steubenbord's Restaurant, Lentz's bathing Pavilion, Stratton's, Jolly's and Frosin's hotels. When Balmer's Baths started burning, everything along New Iron Pier Walk was doomed. The tall Observation Tower's sign caught fire in the intense heat and soon it became a blazing torch. A few minutes later, the tower collapsed and fell inward on its base. The fire was contained by 4 A.M. between West 5th and West 10th Streets. The steel framed Giant Racer roller coaster at West 10th Street may have acted as a firebreak and prevented destruction of Feltman's and the Bowery. 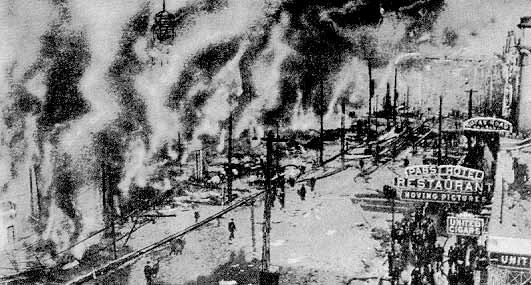 More than 400 firemen had fought the blaze. By daybreak, the scene was of devastation. Only one or two twisted arches were left of the bridge that had spanned Dreamland's lagoon; all else was leveled. Even Dreamland's steel pier and the Iron Pier were reduced to smoldering piles. The loss was more than $5,200,000 with little of it insured. More than 2500 people (1600 at Dreamland alone) had lost their jobs. Dreamland was nothing but smoking ruins the following morning. The owners of Dreamland had suffered a $3,500,000 loss and decided not to rebuild. Their park hadn't been the success they thought it would have been. Since they were politicians, they had little trouble in unloading the property to the city for $1,800,000. The Dreamland fire had ended an era with its most spectacular and costliest pageant. It employed a cast of thousands and was witnessed by an audience of hundreds of thousands. Unfortunately it wasn't at the end of the season but opening day. There would be nothing to replace it.